Most scientists have a detailed knowledge of their own narrow field of specialization, a general knowledge of fundamental science, an understanding of the scientific method, and a mental model that encompasses a broad range of scientific disciplines. This model serves as the basis of their thoughts about scientific questions. When a scientist desires to refine his understanding of a specific scientific subject, he often begins by reading one or more review articles about that topic. As he reads, he compares the facts given in the review with his mental model of the subject, refining his model and updating it with current information. Review articles do not present new discoveries. The essential facts given in the review must be referenced to the peer-reviewed scientific research literature, so that the reader can check the assertions and conclusions of the article and obtain more detailed information about aspects that interest him. 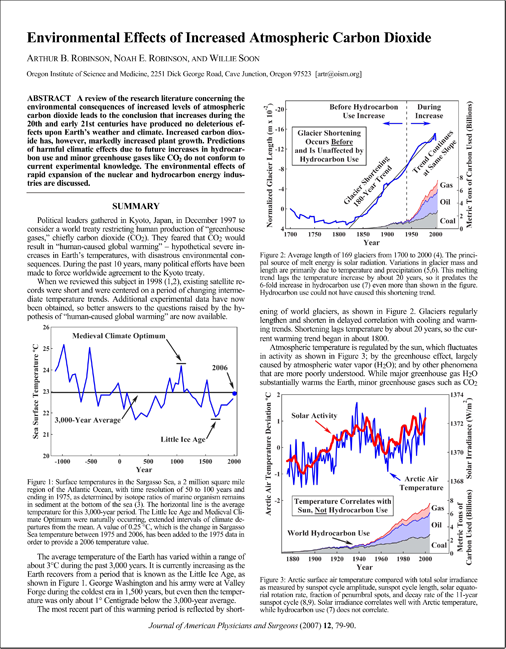 A 12-page review article about the human-caused global warming hypothesis is circulated with the petition. To view the entire article in html, 150-dpi PDF, 300-dpi PDF, 600-dpi PDF, Spanish or figures alone in powerpoint or flash, click on the appropriate item in this sentence. The factual information cited in this article is referenced to the underlying research literature, in this case by 132 references listed at the end of the article. Although written primarily for scientists, most of this article can be understood without formal scientific training. This article was submitted to many scientists for comments and suggestions before it was finalized and submitted for publication. It then underwent ordinary peer review by the publishing journal. The United Nations IPCC also publishes a research review in the form of a voluminous, occasionally-updated report on the subject of climate change, which the United Nations asserts is “authored” by approximately 600 scientists. These “authors” are not, however – as is ordinarily the custom in science – permitted power of approval the published review of which they are putative authors. They are permitted to comment on the draft text, but the final text neither conforms to nor includes many of their comments. The final text conforms instead to the United Nations objective of building support for world taxation and rationing of industrially-useful energy.